Fortune 500 and nationally-known companies are not the only ones who face ethical dilemmas in their decisions. Smaller and lesser-known companies also grapple with the ethical implications of both their day-day and long-term decision-making. In my Paper 2, I will take a look at the strategic decisions behind local grocery store chain, Giant Foods. In this blog post I will give a summarized version of the case and a glossed over version of the results (sort of spoiler alert but not really). Fortunately for me, my dad has a management position in Giant, so most of the information in this post is from using him as a source. On October 10, 2014, Giant Foods opened its new store located just off of I-81 and Wertzville Road in Enola, Pennsylvania. A few weeks previous, Giant closed its long-time successful store 2.3 miles away on Wertzville Road located in Pennsboro Commons Shopping Center. Giant has owned the leasing rights to the land for the new store for ten years. Approximately three years ago, the real estate developer for the land told Giant that they must do something to develop the land or else they would not be able to renew their lease for the 25-30 acre plot. Giant was only holding the land to prevent competitors like Wegmans from entering the market, but now they were faced with a difficult decision. It was clear that Giant needed to build a new store on this plot of land, but what should they do with the existing Enola store? Closing the old Enola store would be a significant blow to the community. That store is the heart of Pennsboro Commons, a shopping center that only exists because of the large number of customers in which Giant brings. The 2.3 miles to the new Giant would be a way bigger issue than most would think. The communities between these two areas are very different, and even more importantly, while the new Giant was technically still in Enola, it now resided in Hampden Township as opposed to the old store which was in East Pennsboro Township. This was a major loss of tax dollars for East Pennsboro Township. Giant’s accounting and real estate teams crunched the numbers of their ROI figures and determined that opening a new store at the new location would increase sales because they would have a new facility, closer location to the highway, and closer vicinity to the technology parkway (new local medical and corporate centers). They also determined that there was no way to keep both stores open; especially since the majority of existing customers would simple drive 2.3 miles to the new store. Spoiler: They were wrong. Old customers were not willing to travel to the new store, and the new customers did not care for the new store. Sales figures missed projections badly (stay tuned for exact figures in Paper 2). Giant was fully aware of the negative implications that closing the old store would have on East Pennsboro Township. They could have tried to make a compromising plan to appease the community but instead they went with the plan for most profit. Ironically, the strategy did not go as planned and Giant is left with an angry community and a less profitable store. 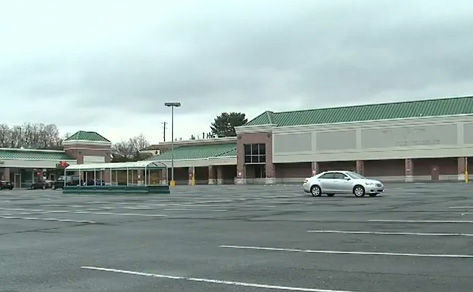 Below are pictures from Google Images of the Pennsboro Commons shopping center layout and a picture of what the parking lot looks like before and after Giant closed its doors.